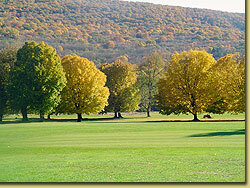 Discover the finest in Pocono Golf. Completed in 1911, the golf course at the Shawnee Inn is A.W. Tillinghast's first-ever design. Rich in the history of golf, Shawnee has been the host of the 1938 PGA Championship, the 1967 NCAA Championships and other memorable moments in the chronicles of golf. Shawnee is still graced with the same magnificent trees, picturesque mountains, beautiful river and the same love of the game. With 24 of our 27 holes located on a private island, The Shawnee Inn and Golf Resort is the perfect choice for golf in the Poconos. The Tillinghast Golf Academy at Shawnee provides instruction from PGA Class A Pros in a variety of settings: individual or group lessons, clinics, corporate outings, TGA Junior Camps and Nike Golf Camps to name a few. Situated on the beautiful grounds of the Shawnee Inn and Golf Resort, the Tillinghast Approach Course offers 9 par 3 holes of varying length.